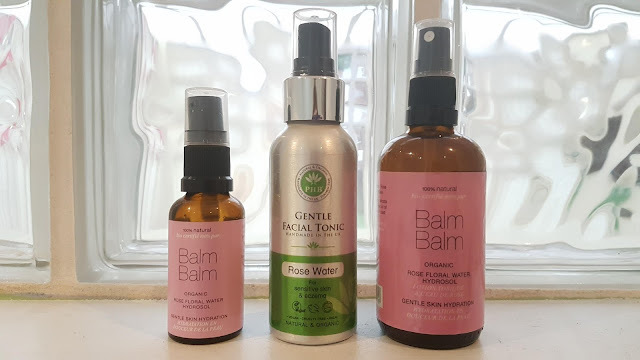 I am a long time lover of the Balm Balm hydrosols, but recently I had the chance to snag the entire Facial Tonic range from PHB, and while they are entirely different from the floral waters offered by Balm Balm, they definitely come with their own unique strengths! PHB has five facial tonics, all targeted for specific skin concerns: Balancing, Brightening, Anti-Aging, Hydrating, and Gentle. 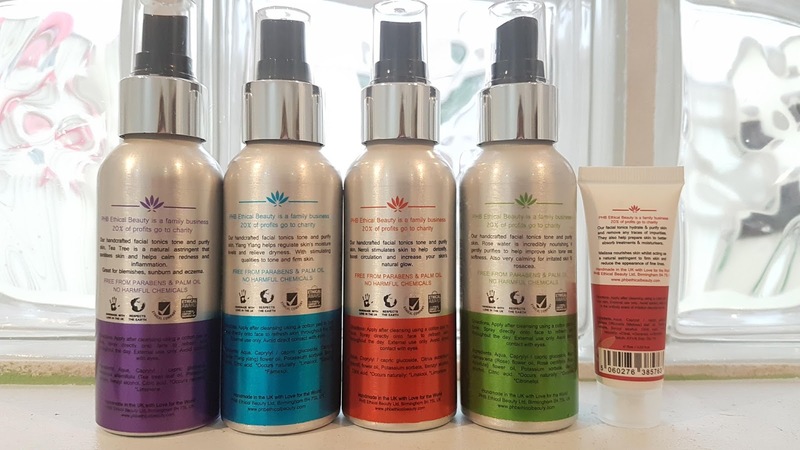 While I personally will only use four of the sprays, I thought I would buy the fifth to both round out my review and treat my partner to a skin treat. He never turns down a free pampering session! 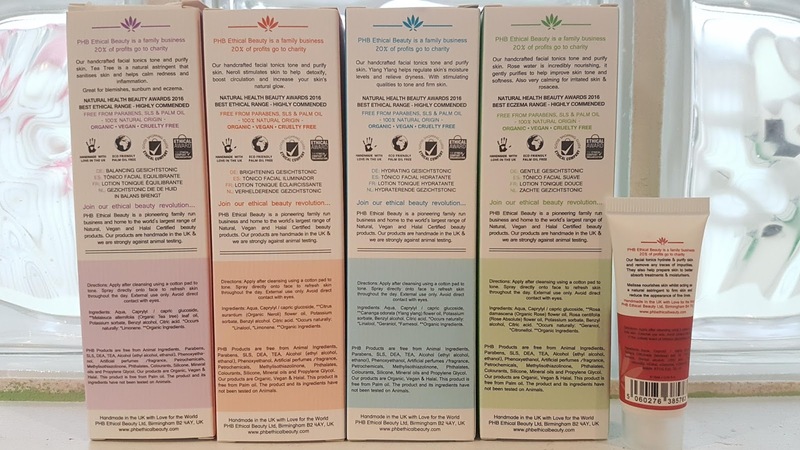 "PHB Products are free from Animal Ingredients, Parabens, SLS, DEA, TEA, PEG, Alcohol (ethanol, ethyl alcohol, alcohol denat. ), Phenoxyethanol, Artificial perfumes /fragrance, Petrochemicals, Methylisothiazolinone, Phthalates, Colourants, Silicone, Mineral oils, Formaldehyde and Propylene Glycol. PHB products are Organic, Vegan & Halal. This product is free from Palm oil. The product and its ingredients have not been tested on Animals." I love knowing I can trust a company, as it takes the stress off me having to do too much research. While these toners are not as 'pure' as the Balm Balm hydrosols, they do a great job at staying as clean and beneficial as possible. 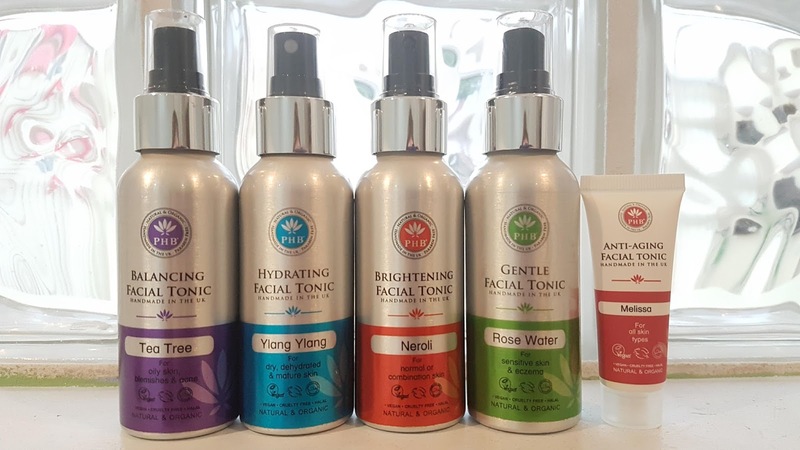 Each tonic is ethanol alcohol and oil free, and aims to restore the skin's natural pH balance. Plus, they feel and smell great (unlike some of the *ahem* less fragrant Balm Balm sprays!) and each have their own special skin type to tackle. The tea tree tonic balances oily skin prone to blemishes and acne, and works to purify and refine. On top of that, it calms redness, helps reduce blemishes, improves skin tone, and generally works towards a clearer complexion. Tea tree, a natural astringent, works as a sanitizing ingredient, and naturally reduces inflamation and helps battle pesky bacteria that forms throughout the day. The spray has a slightly antiseptic smell, but it is not unpleasant. I tend to use this tonic after cleansing, or regularly spritz throughout the day if I am having a breakout. Ingredients: Aqua, Melaleuca Alternifolia Flower Water (Tea Tree), Citric Acid, Potassium Sorbate, Benzyl Alcohol. *Limonene. *Occurs naturally in essential oils. Next up is the hydrating ylang ylang, a floral spray designed for dry, dehydrated ,and mature skin, that I have not actually encountered very often in the natural skincare world. I love ylang ylang, and regularly use the PHB brightening hand cream that includes this slightly sweet plant extract. Unfortunately my product came a bit damaged, so I have only been able to use this as a more traditional toner (on a cotton pad) rather than a spray like I usually prefer. While the other products feel really light and don't leave any feeling (other than a brief wetness!) on my face, this one does feel a bit heavier sitting when I first wipe it on. However, I have not been disappointed despite the unexpected application. The tonic is meant to help maintain skin elasticity, calm redness, soothe minor skin irritations like tightness or dryness, and help firm and stimulate while hydrating your skin. While I haven't noticed any drastic differences yet, I have experienced less 'tight' skin after showers when I have used this tonic. Ingredients: Aqua, Cananga Odorata Flower Oil (Ylang Ylang), Citric Acid, Potassium Sorbate, Benzyl Alcohol. *Benzyl Salicylate, *Geraniol, *Benzyl benzoate, *Farnesol, *Linalool. *Occurs naturally in essential oils. The neroli tonic assists in the brightening of the skin and is best for normal and combination skin. Like I said above, I love PHB's brightening hand cream, and so far this facial tonic has been just as lovely. This is the most pleasant smelling of these toners, with a gently sweet and citrusy but green scent that lingers a little longer than the other tonics. The brightening tonic is perfect for boosting circulation which leads to the skin looking fresh and radiant. By protecting the collagen and elastin in the face, this tonic is meant to help the skin stay looking 'youthful' and give a natural glow. While I don't have any need of keeping my skin looking youthful yet (I mean, I still get ID'd regularly despite being 25 for goodness sake! ), I do love the rosiness this tonic lends me. The final tonic I have been trying out for myself is the rose toner. I absolutely love rose -- water, oil, you name it -- if it is rose I will try it. I find rose based products really help maintain the natural oils in my face (along with the help of some other trusty products), and keep me fresh and hydrated. This one is no different, although this tonic has a slightly strange 'second' smell which I have not quite figured out. Just as light on the skin as the other toners, the rose facial tonic has the added benefit of being designed for all skin types, and specifically for sensitive skin. PHB has somehow taken the best benefits from all the other sprays they offer and rolled them all into this lovely floral water: purifying, super hydrating, calming, and brightening -- if you want an all in one toner, this is probably your best bet! My partner, lucky him, was my test subject for the anti-aging facial tonic that contains Melissa, a citrus smelling plant. While I can't attest to how it feels, my partner doesn't seem to mind it and doesn't shout in horror whenever I use it on him, so that is a good sign! He doesn't mind the smell, and he has recently commented on how healthy his skin is looking. This tonic is designed for mature skin, and helps reduce fine lines by nourishing and firming the skin. So far, so good it seems! 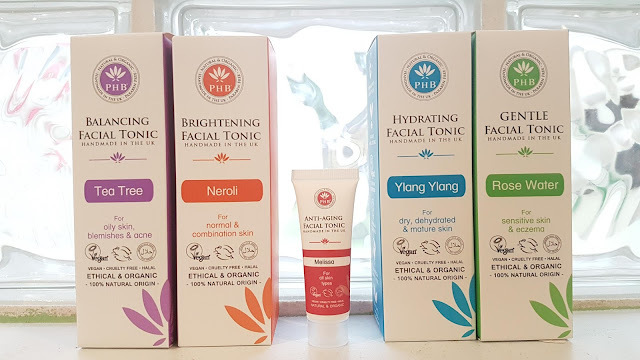 While the PHB facial tonics do contain natural preservatives unlike their competition, they do offer a great value for size and effectiveness. 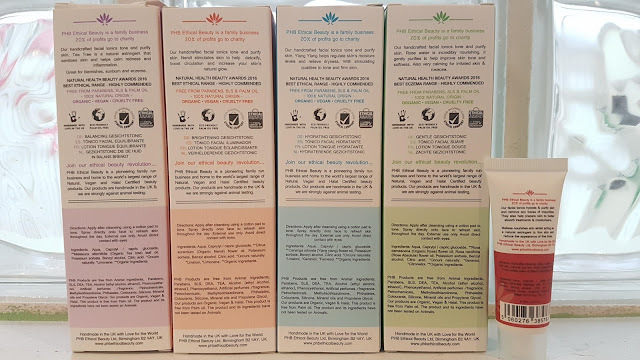 As you can see, the PHB tonic is 100 ml (and can also be bought in 15ml travel sized for the Brightening and Anti-Aging versions) compared to the Balm Balm which comes in both 100ml and 30ml for their entire hydrosol range. 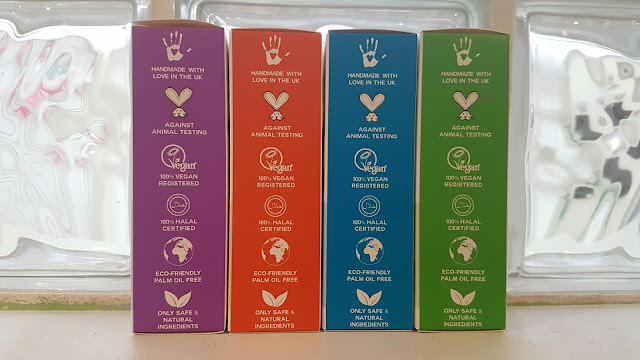 However, when it comes to price, PHB definitely wins out as the cheaper option for four of their five products, costing between £13.95 and £14.95, whereas most of the Balm Balm hydrosols are £16.50 for the same amount of product. All in all, I am surprisingly pleased with the PHB facial tonics. I was worried they would smell less fragrant, feel sticky, or not be as effective when it came down to it, but the brand has continued to show their strengths for me! *Edit (1 year on): my skin has changed slightly over the last year, and I have since found that these tonics do not play well with more sensitive skin as the levels of essential oil are more concentrated than most toners. That being said, I do still love them and use them regularly as a hair rinse and even occasionally in the bath! I have bough the whole set of brightening line, which includes the neroli toner. I can't wait to try it! But have to finish others first. Thank you for the review! I hope you enjoy it! I've been using some samples of the brightening moisturizer and eye cream which I really like, and the mask and hand cream are lovely.